Becky Lynch spoke with Gorilla Position before last night's episode of SmackDown. 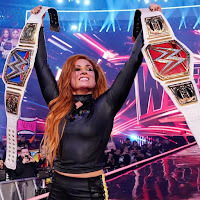 During the conversation, Lynch talked about Vince McMahon's reaction to the first-ever women's main event at WrestleMania, the controversial finish, if she thinks Ronda Rousey will be back after her loss, and what her relationship is like with Rousey. After Sunday's match was done, Lynch was asked how Vince reacted to it and it sounded like he gave Lynch, Charlotte, and Rousey's performance a thumbs up. "He just said he was so proud of us," Lynch said. "He was so proud of us. He did [give us a hug]. He did, yep, but I said, 'I'm The Man now, Vince' and he said, 'Yep!" The ending of the match caused a bit of a stir among fans as Lynch got the one-two-three against Rousey, who looked to get her shoulders up part-way through the count. Reportedly, this was by design to set up a rematch down the road. In regards to the finish, Lynch was happy with how things ended. "I'm happy I beat her with a wrestling move after she insulted my business," Lynch began. "She insulted my business, and I beat her with a wrestling move. That's all we need to know, the ref counted to three and I became 'Becky Two-Belts." After losing on Sunday, Rousey was absent from Monday's RAW, which Lynch wasn't surprised at all by. The champion was asked if she thought Rousey would ever make it back to WWE after losing on the big stage. "I said it last night, I said, 'Ronnie, ya little weirdo, whenever you're done sulking 'The Man' will be right here, ready to slap your empty head off your shoulders again,'" Lynch said. "I would love to see her come back. I would love to slap her across the face again, kick her in the gut, take her arm and rip it right out of its socket, but we'll see if that's in the cards for her. I know she's hiding under her blankie, having a bit of a cry right now." With the very public social media war leading up to the WrestleMania match-up, Lynch was asked what he actual relationship was with Rousey. It didn't sound like there was much of one. "I beat her," Lynch said with a smirk. "I beat her. That's it. That's how my relationship is with her. I beat her in all the ways. I beat her in the war of the words and I beat her in the war of the ring."